Parallels 4 vs. VMware Fusion 2 | What a n00b! Parallels recently released version 4 of their desktop virtualization software promising 50% better performance over the old version. I have used both VMware on Linux and Parallels on Mac for some time and decided to put them to test on the same system using VMware Fusion and Parallels Desktop 4. My hardware was a Core 2 Duo MacBook at 1.83Ghz with 2GB of RAM. The machines were stored on an external hard drive attached via FireWire. My host OS was Mac OS X 10.5.5 and I used 32-bit Ubuntu 8.10 desktop as the test guest OS. I gave each machine access to both cores and 1GB of RAM. Most of my tests were very unscientific, but general observations about the usability of the machines in each software. Since I wanted to start with fresh installs, the first step was to lay down an install of Ubuntu. I didn't take any time measurements during the installer, but the installer in VMware was noticeably faster than Parallels. After the installation, I did a quick test of the boot speed of each. Ubuntu booted in 1 minute 28 seconds from the time I clicked the power button to when it was usable in Parallels and 1 minute 20 seconds in VMware. Really, there's not a lot of difference there. VMware was also slightly slower when I opened OpenOffice 2.4. In Parallels, it took 11 seconds before it was usable compared to 9 seconds in VMware. 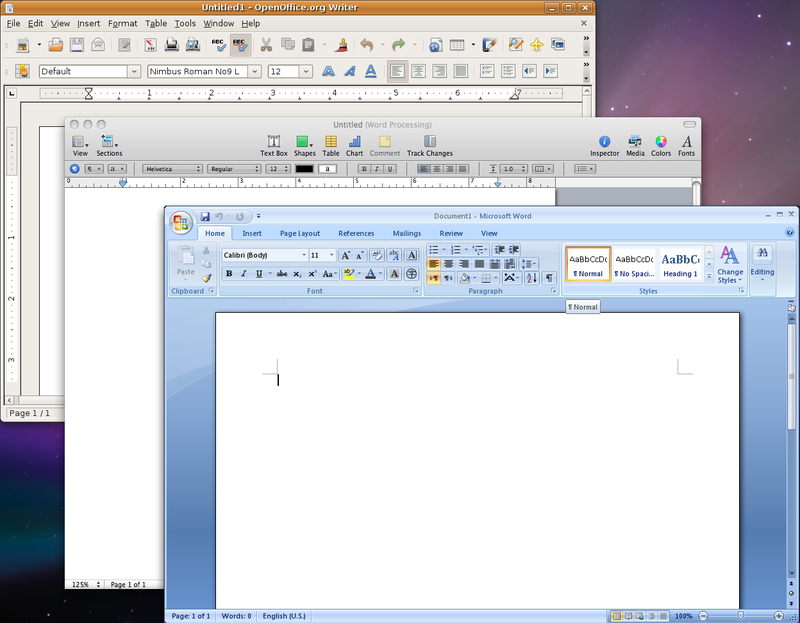 The Parallels tools and VMware tools installations were significantly different. The Parallels tools installation was a very simple menu-driven installer from the terminal. It took just a couple of minutes to install and a quick reboot and we were up and running. The VMware tools installer was easy as well, but a bit longer with a few more options. After the first install, the mouse driver wouldn't let the cursor leave the guest when it got to the edge of the machine window. I had to update the Ubuntu kernel to make it work. Upgrading the kernel was definitely recommended anyway, but I thought it would be worth noting. I opened up SSH on my OS X box so Ubuntu detected it from the "Places" menu in Gnome as an SFTP server. I logged in and transferred an .iso file from my home directory over to the guest. The file was 637MB. I transferred the file in Parallels in 3 minutes 7 seconds and transferred it using VMware in 2 minutes 15 seconds. VMware wins again. VMware also allowed drag-and-drop files from OS X to the Ubuntu guest. Parallels didn't offer support for that and neither offered drag-and-drop transfers going back. I transferred the .iso again using drag-and-drop to the VMware machine and it ran almost as fast as the SFTP transfer, transferring in 2 minutes 18 seconds. No performance test involving Linux would be complete without glxgears. Surprisingly, the tests seemed to swing the opposite way and Parallels excelled at this test. VMware ran glxgears at a mere 155FPS, but the Parallels guest was able to run at 231FPS. VMware seemed to be slightly faster in booting and launching applications, but Parallels had simplicity and video responsiveness on its side. The VMware tools were slightly more involved to install and had to be copied to the guest and extracted and Parallels tools slightly more simply. The VMware drivers also required me to update before automatically moving the cursor from the virtual guest to the host at the edge of the screen. 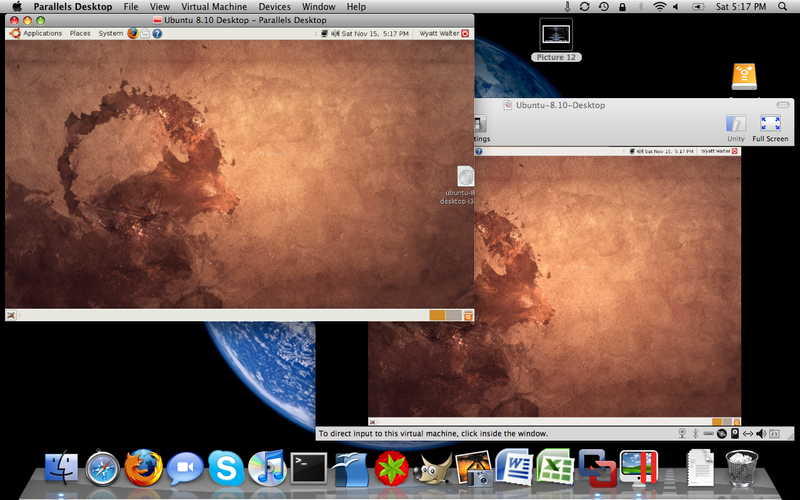 However, VMware did allow the user to drag files from OS X into the virtual guest. Unfortunately, without running Windows you don't get a lot of the features that VMware and Parallels offer, but support for Linux in both seems to be coming along nicely. Thanks to Pete from VMware who pointed out that there was a newer build of VMware available (the software did not prompt me for an update). I updated to the new version and Unity works great. Unity from the VMware platform was a definite plus since it allows applications from the guest to be in separate windows alongside the windows from the host OS. I did notice that video was quite a bit more choppy when in Unity view and glxgears showed around 127-128FPS rather than the 155 that I was seeing without it turned on, but the system was still usable. One thing that happened to me with the newer version of VMware tools was that when I clicked on any of the menus in Gnome and went down the list, it would consistently click the mouse for me. Eventually it stopped, but fairly annoying for just a few minutes.